Brumadinho, Brazil: An alarm warning of an imminent mining dam rupture went up early Sunday in Brumadinho, the same Brazilian community where a dam collapsed killing 34 with hundreds more feared dead, firefighters and the mining company said. An alarm warning of dangerously high water levels at a dam that is part of the Corrego do Feijao mining complex in southeastern Brazil went off at 5.30 am (0730 GMT), a statement by the mining company Vale said. A dam at the same mining site burst on Friday, spewing millions of tonnes of treacherous sludge and engulfing buildings, vehicles and roads. Firefighters said they immediately began evacuating communities near the dam. "Attention, general area evacuation!" blared a warning through loudspeakers in Brumadinho, population 39,000. "Find the highest point in the city," the warning said. Vale's CEO Fabio Schvartsman and Minas Gerais Governor Romeu Zema earlier warned that the death toll from the Friday rupture could rise. "From now, the odds are minimal (to find more people alive) and it is most likely we will recover only bodies," Zema told reporters late Friday. In Rio, Schvartsman spoke of a "human tragedy". Search and rescue operations, suspended overnight because of rain, resumed at 4 am (0600 GMT). Dozens of helicopters were set to be deployed because the thick mud was treacherous for ground rescuers to venture into. Among the more than 170 survivors rescued from the disaster, 23 were hospitalised with injuries. Brazilian President Jair Bolsonaro flew over the devastated zone on Saturday, later tweeting that it was "difficult to not be emotional before this scene". All was being done to care for survivors and "determine the facts, to demand justice and prevent new tragedies," he added. The military said it deployed 1,000 soldiers, including sniffer dogs, to the disaster zone. Separately, an Israeli team of 130 soldiers equipped with cellular location equipment, drones and naval sonars is set to reach the area Sunday to help search for survivors and bodies, an Israeli military spokesman said. The team is expected to stay for one week. The disaster was the first big emergency faced by Bolsonaro and his government since he took office in early January, and may be one of the deadliest disasters in Brazil's history. Vale has been shaken by the disaster, the second in three years it has suffered in the same state. Workers at its mine had been at lunch in an administrative area Friday when they were suddenly swamped by millions of tons of muddy trailings - a waste byproduct of the iron-ore mining operations. The ruptured dam, 42 years old and 282 feet (86 meters) high, had been in the process of being decommissioned. Vale said it had recently passed structural safety tests. 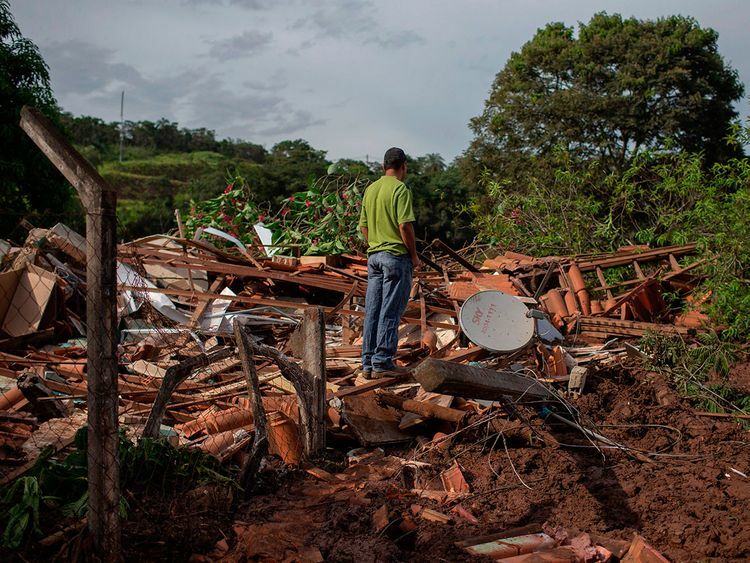 After overflowing a second dam, the muddy mass barreled down toward Brumadinho but only glanced along the town before roaring through vegetation and farmland, smashing houses and swallowing tractors and roads in its path. Vale shares plummeted on the New York stock exchange Friday, closing eight percent lower. Brazil's environmental protection agency hit Vale with an initial $66.5 million fine over the disaster. Minas Gerais state authorities said they were about to levy another penalty. They have already obtained a court order blocking $270 million of Vale funds in bank accounts with a view to using the money for victim relief. The mining company, one of the world's biggest, was involved in a 2015 mine collapse elsewhere in Minas Gerais that claimed 19 lives and is regarded as the country's worst-ever environmental disaster. Would-be rescue volunteers were urged to stay away because of the slippery, perilous mud. Media were pressed not to use drones to avoid collisions with rescue helicopters. "There used to be people here, houses. I'm just floored by this tragedy," Rosilene Aganetti, a 57-year-old resident in one of the affected villages, told AFP, pointing to an expanse of mud. "Several of my friends who were in the Vale cafeteria are missing," she said, holding back sobs. Another woman, Suely de Olivera Costa, desperately trying to find her husband who worked at the mine, accused Vale of "destroying Brumadinho and nobody is doing anything - what will be the next town?" The Brazil office of environmental group Greenpeace said the dam break was "a sad consequence of the lessons not learned by the Brazilian government and the mining companies." Such incidents "are not accidents but environmental crimes that must be investigated, punished and repaired," it added. In 2008, a moving mass of mud and rocks from an illegal iron ore mine slammed into the Chinese town of Taoshi, in northern Shanxi province, killing 262 people. A mine collapse at a gold mine in Merriespruit, South Africa caused 17 deaths in 1994.